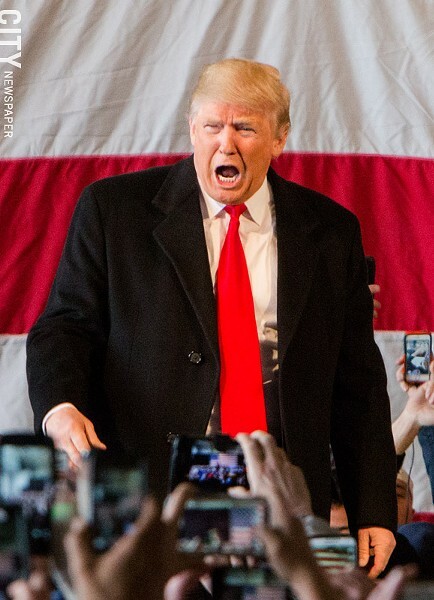 FILE PHOTO Republican presidential candidate Donald Trump during a Rochester-area rally earlier this year. It would be wonderful to find something in politics to be optimistic about, but if it’s out there, I’m not finding it. And Marine Le Pen’s showing in the French election on Sunday hasn’t helped my mood. There’s an ugliness bubbling up, here and in Europe, that doesn’t seem to be ebbing. Shortly before November’s presidential election, I wondered if the outcome would show us what kind of country we are. I think in many respects it did. And it’s a very, very different country than it seemed the morning after Barack Obama’s election in 2008. It’s a very different country, in fact, than it seemed during most of Obama’s eight years, right up until the waning months, when a once sensible political party nominated an unqualified, temperamentally unsuited man for president. And voters elected him, despite the evidence of his ethical and intellectual failings. They elected him even after seeing a video of him bragging about his sexual assaults. So many things helped set the stage for this. (High on the list: the arrogance of the Clinton camp, the irresponsibility of Republican leaders like Mitch McConnell, and, back in 2010, the hypocrisy of the Supreme Court majority in Citizens United.) But the Clinton camp’s arrogance didn’t put Donald Trump in the White House. Nor did the complicity of Republican leaders, nor the heavy billionaire funding of anti-Clinton efforts. Nor did James Comey. Voters – enough of them in enough of the right places – put Donald Trump in the White House. Voters knew everything they needed to know about him, and they voted for him anyway. They wanted him in the White House, not Hillary Clinton. There’s been a good bit of media analysis of Trump voters lately. They elected a president and a Congress who want to wipe out the Affordable Care Act, who are anti-labor and pro-big business, who want to cut taxes for the wealthy. Didn’t Trump’s supporters realize they were voting against their own interests? But Trump also promised to “put America first.” What if, for many Americans, that’s more important than affordable health care, a sensible tax policy, and all that? What if they are putting love of country – “country” as they believe it to have been, once – over self? If that’s the case, it will take a lot to shake their loyalty. And as Blake notes, a new Post-ABC News poll also has grim news. More Clinton supporters than Trump supporters wish they had voted for someone else. “Fully 15 percent of Clinton supporters say they would ditch her,” Blake writes. “Trump leads in a re-do of the 2016 election 43 percent to 40 percent,” although in November, he lost the popular vote 46 percent to 44 percent. A hot-tempered, authoritarian nativist who has embraced racists and anti-Semites is president of the United States. Millions of Americans are very glad that he is. And despite his false steps, despite his about-face actions on some major campaign promises, as he approaches his 100th day in office they’re not having second thoughts. That will be on the mind of every member of Congress as this president and his appointees stoke our fears and prejudices and push to erode voting rights, build a border wall, back off from criminal-justice reforms, denigrate science, embrace fossil fuels, and wave their sabers. This is not the country many of us thought it was. And I’m not sure anybody knows how to bring it about.